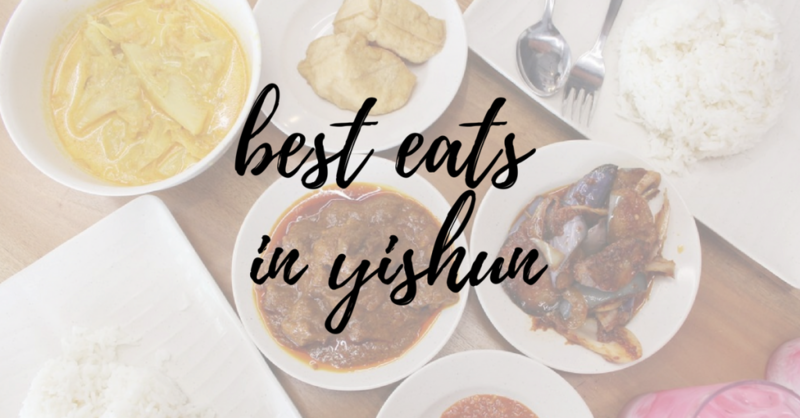 Yishun is probably not one of the first few places we’ll think of when we wanna look for great yummy food in Singapore. But don’t dismiss this new town up north quickly as a pathetic and boring place for foodies yet. Let the hidden yummy food in Yishun make you relook at this suburban neighbourhood. Read on to discover the top 16 yummylicious all time best eats and new eats so good, you wish you could have them now! As the name of this stall implies, they sell real “ho-jiak” (“delicious” in Hokkien) rojak, a popular local delight. Hojiak Black & White Rojak has been faithfully serving the palatable delight to residents around Khatib MRT for a long time. While it has moved from one coffee shop to another within the same neighbourhood, it is always strategically located next to the drinks stall. Rojak served with the black shrimp paste (“hae ko”) is considered a sinfully unhealthy food. But who can resist the plate of crisp tofu and dough fritters, with crunchy cucumber and turnip slices drizzled with lots of diced peanuts? I can’t! If you prefer a healthier version, try the white rojak which is served with sour plum sauce, a refreshing tangy taste that is equally yummy too! Serving one of Singapore’s hawker favourites for over 2 decades, Yishun 925 Hainanese Chicken Rice is well known for its boneless juicy and tender chicken meat. Shami Banana Leaf Delights is a popular Indian food stall that started operations at Northpoint Shopping Centre food court since 1993. There were crazy queues in front of the stall during meal times back in the good old days. Their signature dish has to be the nasi briyani set that comes with flavourful meat served on fluffy briyani rice. With the expansion of 2 outlets at Food Republic Causeway Point and Sembawang Road, it’s now more convenient to get your briyani fix! Enough of chicken, folks in Yishun love duck meat too! And so, we love Chuan Kee Braised Duck Rice in Chong Pang Food Centre. The boneless braised duck meat here comes in a generous serving doused with thick dark gravy, accompanied by slices of soft braised tofu and flavourful peanuts. No wonder there is always a queue at the stall! 928 Yishun Laksa has been around for decades, and it remains as one of the best food legacies Yishun is proud to own. I remember eating this for the first time after school with my classmate many moons ago. Up till today, it’s common to find long queues in front of the stall, especially during meal times. Who can resist a fragrant bowl of piping hot creamy laksa? We can’t! Open: Tue to Sun 11 am to 7 pm. Closed on Mon. Yet another perennial favourite of the northlanders, Chong Pang Nasi Lemak started as a humble stall in the Chong Pang Village Hawker Centre in 1973. Over the years, it has gained such a huge following with its freshly cooked dishes that it has since relocated to a coffee shop along Sembawang Road to cater to a larger crowd. The coconut rice is aromatic but not overpowering. Popular dishes include the specially marinated chicken wings fried to perfection, spicy long beans and sambal brinjal. For a really satisfying meal with a kick, don’t forget to add their signature chilli sauce! Also found in Chong Pang Food Centre, Xiang Xiang Fishball Noodles is one of my favourite comfort food. This is a familiar name to many of those who grew up in the old kampung days in Nee Soon. As one of the rare hawker stalls that still serves food to your table, Xiang Xiang’s fishballs are big and springy, made with fresh yellowtail fish or ikan parang. Try the dry spicy version for a savoury bowl of noodles tossed with a generous mix of lard, chilli paste and soy sauce. The accompanying soup is lightly flavoured with “chye poh” (preserved turnip) which adds to the fragrance! Nestled within the quiet Nee Soon South district at Fujo Eating House, 618 Sim Carrot Cake is the place to satisfy your cravings early in the morning! Located about 10 min away from Khatib MRT station, count your lucky stars if you manage to tuck into a yummy plate of fried radish cake mixed with a plentiful amount of “chye poh”. On weekdays till 9.30 am, you can ask for either black (fried in dark sweet sauce) or white carrot cake. However, only the white carrot cake is available on weekends. Be prepared to wait around 10 minutes or so on weekdays, and up to 30 minutes on weekends! Do you know that there is a Heng Hua Restaurant tucked in a quiet corner of Yishun, serving heartwarming Fujian Henghua cuisine? It is a homely zi-char style eating house serving a variety of authentic dishes at reasonable prices. Classic dishes include the Heng Hua Style Lor Mee and Fried Bee Hoon. Who needs Putien when we have such a nice cosy eatery in Yishun? For a taste of Thailand, Yishun residents can find comfort at Bei Sheng Taste of Thailand Restaurant in Chong Pang City. Tuck into your favourite zi-char dishes with Thai influence. A must-have at this restaurant is the Tom Yam Soup, with plenty of seafood cooked in the aromatic broth. As its name implies, enjoy a variety of fresh and yummy seafood here, such as the signature Thai Deep Fried Fish Delight. There’s also another outlet, Taste of Thailand, run by the same family, at 1001 Yishun Industrial Park A.
Vegetarians in Yishun are not left out. Zi Zai Vegetarian is a popular vegetarian eatery in the community. With a myriad of vegetarian dishes available, you’ll never be done trying them all! Must-try dishes include the signature crispy yam ring filled with lots of yam, cereal vegetarian prawns and claypot tofu. If you think vegetarian food is boring, you haven’t been to Zi Zai Vegetarian! Jin Ma Che (H.K) Roasted Porridge Noodle House is another mean foodie place where you can satisfy your craving for roast meat delights. Strategically located opposite Chong Pang Camp, be prepared to fight with army personnel for your steaming plate of fragrant rice topped with thick cuts of roasted meat. What sets this apart from other roast meat stalls in Yishun is its rich and flavourful sauce. Their porridge, only available on weekend mornings, is worth the wait too. Try some yourself and you will know what I mean! Yishun not only has yummy hawker delights to boast of, we are also able to savour cool French cuisine at The French Table. Sink your teeth into traditional French dishes like their signature Duck Confit, and Roasted Chicken. The best part of the deal, this casual dining restaurant is wallet friendly! Nestled in a relatively new neighbourhood in Yishun, Doughwory Bakery is a hidden gem amidst all the construction. This cosy 8-seater bakery cafe is great for some caffeine fix alongside its attractive array of pastries. Besides lemon cheesecakes, croissants, and hotdog cheese buns, the rainbow cake and buttermilk waffles are highly raved about. Psst… don’t say I didn’t tell you, go early to avoid disappointment! Coba Coba is a retro-looking cafe tucked in a quiet corner of a HDB block that serves traditional Nasi Padang. Tuck into favourite dishes such as Terung and Sayur Lodeh that taste just like homecooked food. No worries about the meal burning a big hole in your pocket though. A great meal with drink costs less than $10 in such a cosy ambience! We recommend choosing your own sides as compared to ordering the Nasi Ambeng. Nakhon Kitchen is a popular casual Thai eatery that started in the Kovan neighbourhood. Since last year, Yishun residents need not travel all the way to northeast Singapore just for a taste of authentic Thai food at wallet-friendly prices. Hooray! Satisfy your Thai cravings with Nakhon’s affordable and quality eats. Best part of the deal? No GST and service charge to be paid here! Open: 12.00 pm to 3.00 pm (Lunch); 5.30 pm to 10.00 pm (Dinner). Closed on Wednesdays.